This cabinet and wall panel piece were made as part of a larger residential project. Quartered cherry was used on the facade, cabinet grade cherry on the interiors. 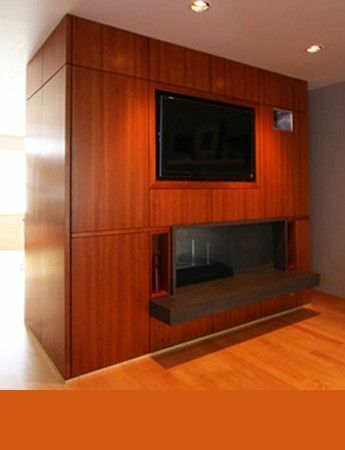 The piece incorporated an existing double sided fireplace, television, closet and stereo equipment. Two full size doors and large drawer fronts are incorporated in the facade allowing easy access to all items stored within the cabinet.